Monk Turner has earned every right to be called the “galactic defender of the concept album”. With a prolific output of over 20 concept albums released in a decade, Monk has experimented with a plethora of styles and genres, collaborated with a staggering number of artists; and explored themes ranging from colours (Kaleidoscope) to a fictional portrait of L.A. in a pre-earthquake crisis (Emergency Songs). It’s hard not to be excited about his latest – God Complex. 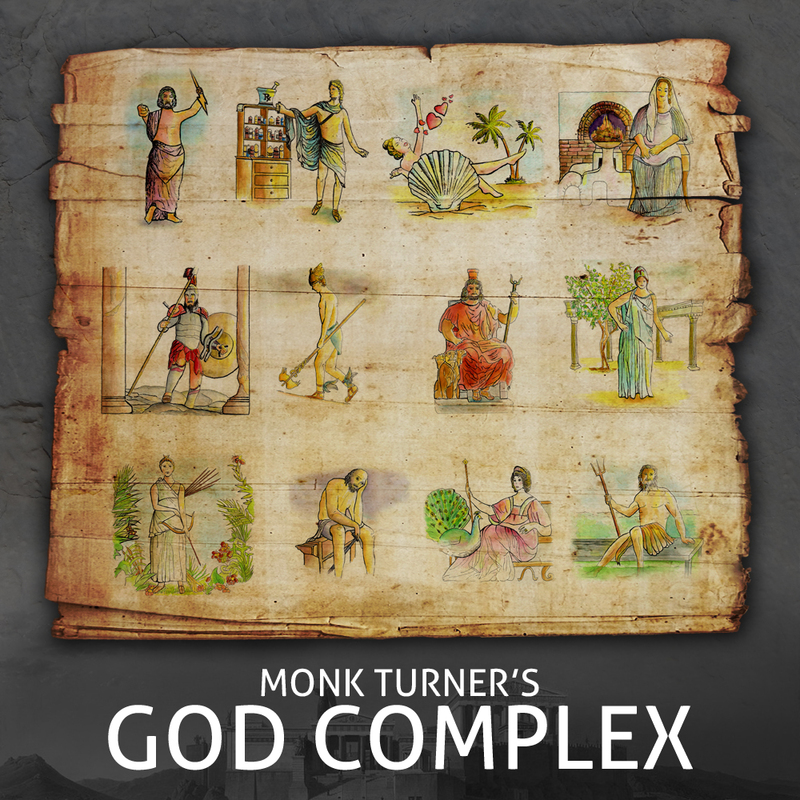 God Complex offers a collection of twelve songs sung from the perspective of each of the major Greek Gods. Contrary to most depictions of Mt. Olympus, the album gives us a satirical angle. Each track plays like a sonically adapted caricature or cartoon strip, comically exaggerating upon the imperfections and oddities of the featured God or Goddess. The mean and angry opener Oh Yes You Will!!! shows us Zeus at his most vain and unpleasant as he sings “You will call me high and mighty/ And you will do what I say” over a thunderous guitar melody. Aphrodite, on the other hand, prides herself on her promiscuity, with lyrics like “I’m not looking for the one/one is not enough/ I need a dozen or more” on Young Lovers for Every Occasion. As always, Monk’s eclecticism is put on vivid display. Though there is a fair share of his signature genre-hopping, he makes the album feel cohesive in sound as a whole, which stands as testament to his songwriting acumen. Young Lovers For Every Occasion is a catchy electronically-tinged folk rock tune; Hermes’ You Won’t Go With a God often evokes Elvis Costello and early Weezer; and the playful Let Me Heal You with its amusingly corny tuba brings to mind the later works of The Beatles. God Complex has been made available as a free download on BandCamp, Free Music Archive and Archive.org, and can also be streamed on Spotify, Apple Music, Google Play, Deezer, Tidal, YouTube Music and Beats/MediaNet. As an interesting addition to the album, Monk has also put out a series of YouTube videos telling us about the background and creation process of each song.